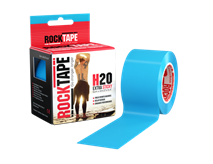 Rocktape - How Does It Work And What Is It Used For? Cryo to purchase your Rock Tape. While the use of kinesiology tape is often associated with elite athletes, however medical professionals have been using it to alleviate a wide variety of ailments, not just sports injuries – and now the same quality tape is available to you. 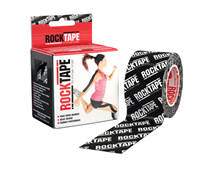 *Please note that if your issues are severe or do not improve within a day of using RockTape, you should seek help from a medical professional. • Relieves swelling through decompression which speeds recovery. • Increases awareness of your body position to help you maintain proper posture and form. RockTape is the world’s best kinesiology tape. It can be used to treat sports and non-sports injuries, including shin splints, plantar fasciitis, runner’s knee and back pain*. RockTape microscopically lifts the skin away from the muscle and fascia below, creating a decompressive effect. Stretchier, stickier and stronger than the competition, RockTape is preferred by athletes and medical professionals throughout the world.